I have the luxury to use quality materials and not been restricted to produce within a cost price. Where most designer focus on making items to fit a cost, at ANUPA my decision process is led by ergonomics, functionality and durability. I visit all my raw material suppliers and research how everything is produced and select materials based on these values. Since I am involved in production as well as a big fan of wearing ANUPA, who better to do the shopping for the materials ! What I find incredibly empowering and interesting is when you begin to select premium materials - sustainability goes hand in hand with all premium production process and why my preference to work with sustainable materials is so amazing. LEATHER: My leather is sourced from farms which results in our leather being a bi-product. 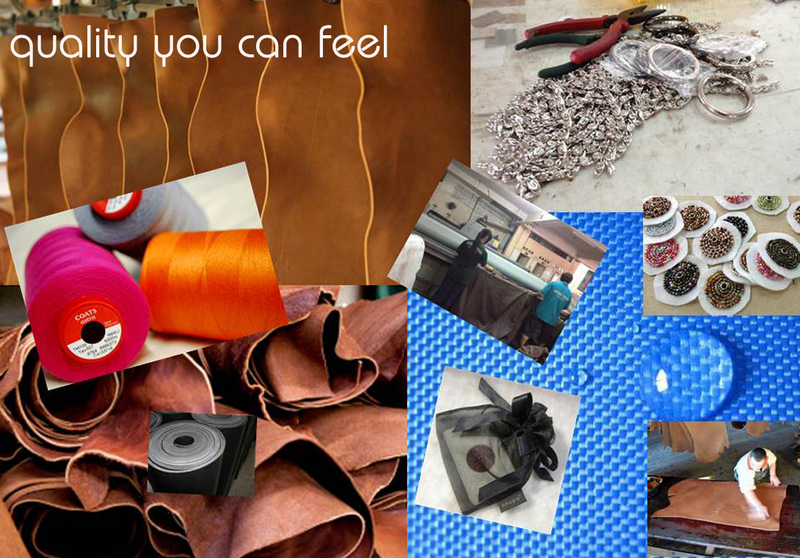 I only work with tanneries using ISO compliant processes and often use tanning techniques from other industries such as footwear and furniture to develop more softer and durable leather. Newer editions of leathers which have been used in recent collections are the tilapia fish which is one of the most common fish eaten on our planet. SEMI PRECIOUS STONES: The jewellery and tourmaline signature which are used in ANUPA products are all ethically sourced and cut in Vietnam. Cutting of gems is kept to traditional methods which are all done by hand, our stones are not chemically treated as I love maintaining natural cut and colour of the gems. THREAD: One of the most important materials in ANUPA’S production process is thread. The quality of thread determines how a product wears and how much weight the bag can handle. I use a non-snap water-resistant thread throughout my production. LINING: ANUPA pieces have to look as great on the inside as they do on the outside where possible I use resilient washable nylon as linings so the pieces last over time. ZIPPERS AND PARTS: Zipper and metal parts where possible I make from scratch and keep my parts as nickel free and durable as possible. All my parts age over time which is something I really love to see. BASE STRUCTURE OF BAGS: I use a recycled rubber base often used in track athlete or sprinters shoes, this helps to keep the leather bags lighter in weight. PACKAGING: All ANUPA purchases are presented in a reusable packaging bag to ensure your piece is protected when it is stored. When gift giving I use handmade ceramic tags which have all been individually hand painted.